Difference between revisions of "JPA Diagram Editor Project Tutorial"
JPA Editor Diagram support all kinds of relations from an embeddable to entity, but not vice versa: One-to-One unidirectional and bidirectional, One-to-Many unidirectinal, Many-to-One unidirectional and bidirectional, Many-to-Many unidirectional and bidirectional. In the Eclipse IDE create new JPA 2.0 project. Open its diagram editor and create two entities and one embeddable. 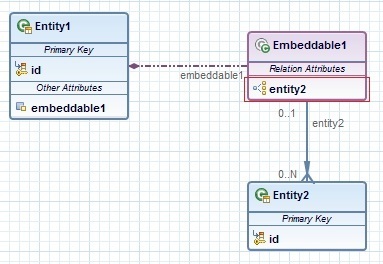 For more information how to create new entity and embeddable follow the steps described in the previous sections [http://wiki.eclipse.org/JPA_Diagram_Editor_Project_Tutorial#Create_new_Entity Create new Entity] and [http://wiki.eclipse.org/index.php?title=JPA_Diagram_Editor_Project_Tutorial#Create_new_Embeddable Create new embeddable]. All kinds of relations are available in the right side of the JPA Diagram Editor, in the so called Palette. This tutorial provides the necessary information on how the Java Diagram Editor can be used. This tutorial is based on the Eclipse Juno and JPA 2.0 projects. To install JPA Diagram Editor project follow the steps described in How to Install section of the JPA Diagram Editor wiki main page. In the Project Explorer view with rigth click of the mouse select New -> JPA Project. Enter the name of the project. 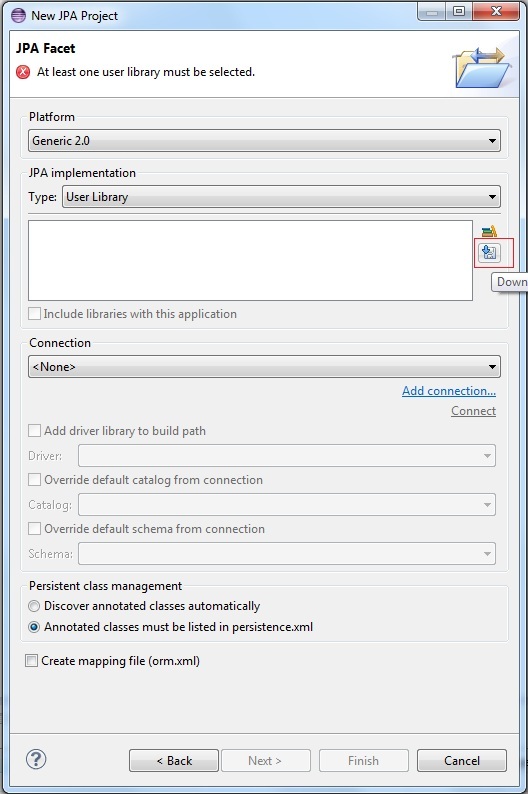 As a JPA version select 2.0 and in the Configuration section select Default Configuration. 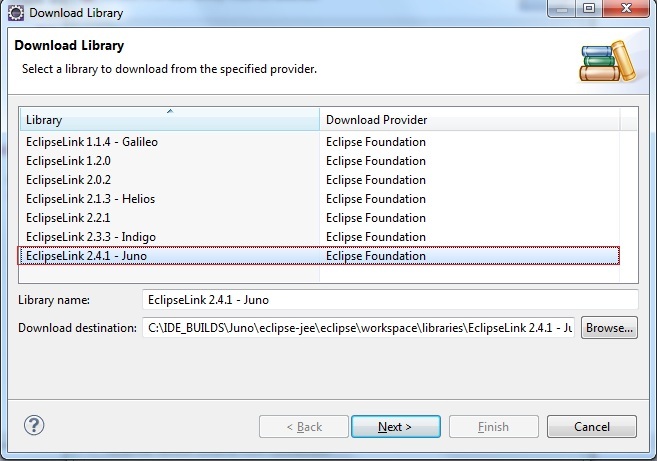 On the newly opened dialog select EclipseLink 2.4.1 - Juno and finish the Download Library wizard. 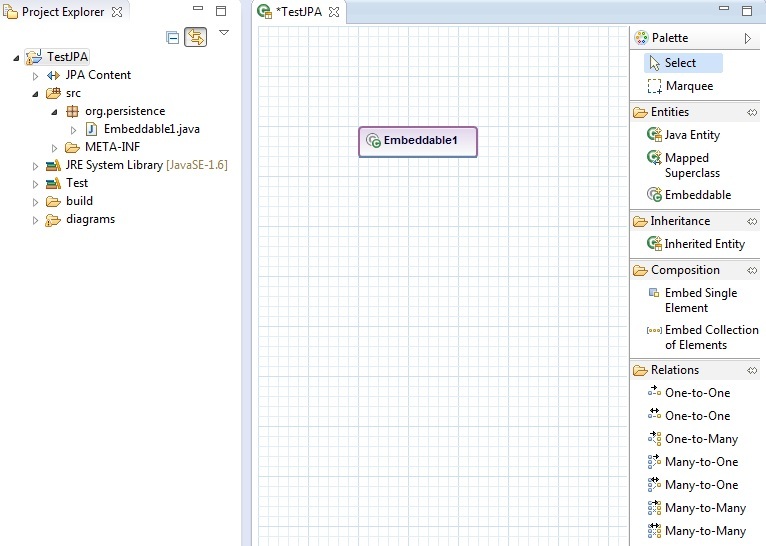 In the Eclipse IDE create new JPA 2.0 project and open the JPA Diagram Editor. For more information on how to do this, follow the steps described in the previous section Open JPA Diagram Editor. In the Eclipse IDE create new JPA 2.0 project. Open the JPA Diagram Editor. For more information on how to do this, follow the steps described in section Open JPA Diagram Editor. Create new entity as you select the created JPA project and from its context menu select New -> Entity. Open the JPA Diagram Editor. For more information on how to do this, follow the steps described in section Open JPA Diagram Editor. expand the JPA project to entity resource level in the Project Explorer view, select the created entity and drag&drop it to the diagram. 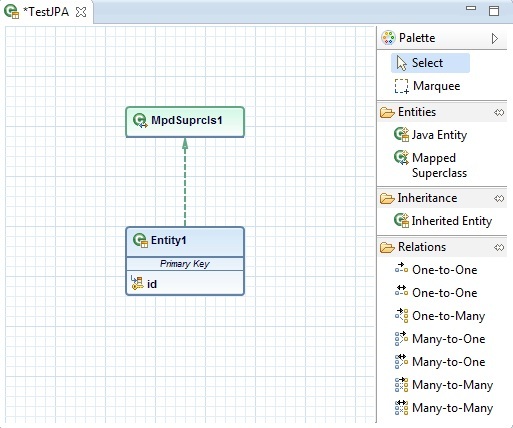 or in the JPA Diagram Editor with right click of the mouse select Show All Entities. 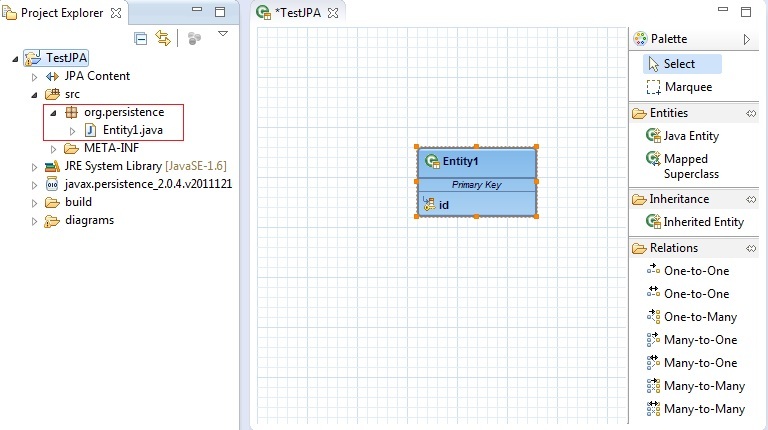 Entity can be moved all around in the JPA Editor Diagram. Just select the created entity in the diagram, hold the mouse and move it where you want to place it. Except that entity resource can be moved from package to package. The default entity package is org.persistence. Select the entity in the diagram and choose Refactor Entity Class -> ... Movefrom its context menu and select the package where you want to move the entity resource. Note: If you double click on the entity, its source code will be opened. 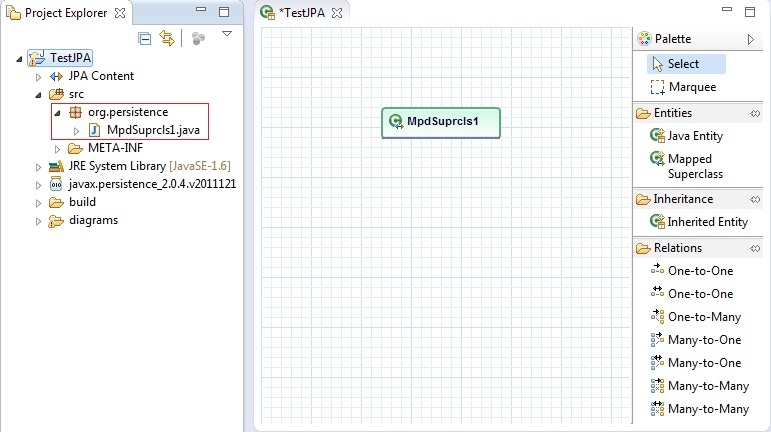 Note: Entity can be edited using the default JPA Details view. 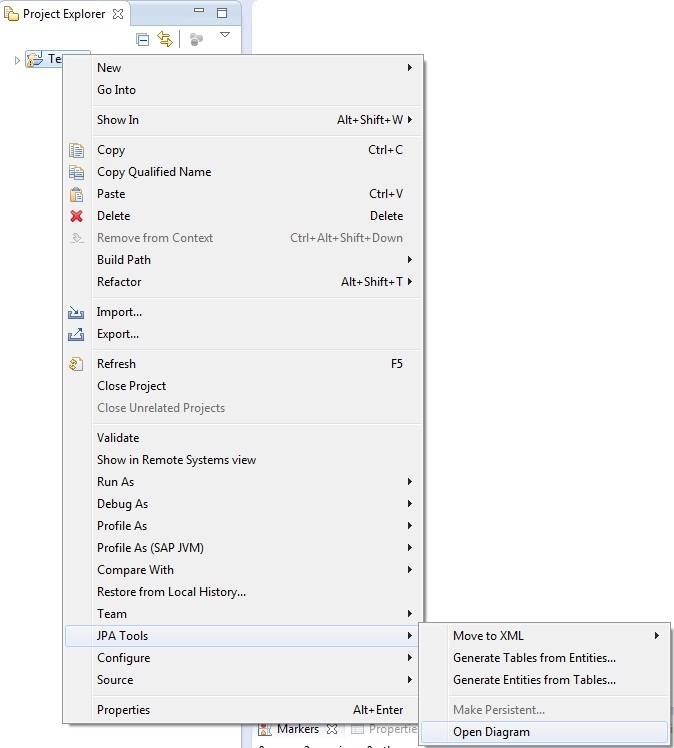 To open it just select the entity and from its context menu choose Open JPA Details View. In the Eclipse IDE create new JPA 2.0 project. Open its diagram editor and create new entity. For more information on how to create new entity follow the steps described in the previous section Create new Entity. 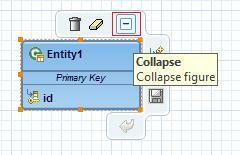 or from its context menu select Collapse JPA Entity. or from its context menu select Expand JPA Entity. In the Eclipse IDE create new JPA 2.0 project. Open its diagram editor and create new entity. For more information how to create new entity follow the steps described in the previous section Create new Entity. Entity can me deleted as a resource or removed only from the JPA diagram. In the Eclipse IDE create new JPA 2.0 project. Open its diagram editor and create new entity. Create new attribute. For more information how to create new attribute follow the steps described in the previous section Create new Attribute. Entity's Attribute can be renamed or its type can be changed. To rename the attribute, select it and press the mouse one more time, the editing area should be shown. Note: If you double click on the attribute, the entity's source code will be opened. To edit the attributes type, select it and from its context menu choose Refactor Attribute Type... and change the attribute type. Note: Entity's attributes can be edited using the default JPA Details view. To open it just select the created entity attribute and from its context menu choose Open JPA Details View. JPA Editor Diagram support all kinds of relations between entities: One-to-One unidirectional and bidirectional, One-to-Many unidirectinal, Many-to-One unidirectional and bidirectional, Many-to-Many unidirectional and bidirectional. In the Eclipse IDE create new JPA 2.0 project. Open its diagram editor and create two entities. For more information how to create new entity follow the steps described in the previous section Create new Entity. Select some kind of relationship from the Palette, for example: One-to-Many unidirectional. A relation is created, and a new attribute is added under the Relation Attributes section of the owner entity. Select some kind of relationship from the Palette, for example: Many-to-Many bidirectional. 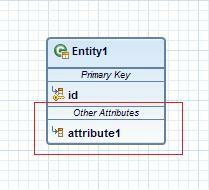 A new bidirectional relationship is created and the both entities have an attribute under Relation Attributes section. 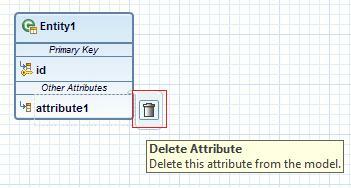 Note: To delete relationship between entities, just delete their attributes which are under Relation Attributes section. Entity's compartments can be collapsed and axpanded too. There is a properties page from which the default package name, entity access type, default collection type for relation creation and etc. can be changed on project level. To open this property page just select the created JPA project in the Project Explorer view and from its context menu select Properties -> Java Persistence -> JPA Diagram Editor. 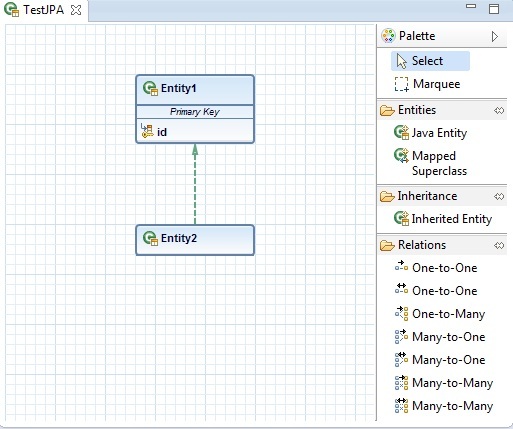 Because an entity can inherit either another entity or mapped superclass, there are two ways to create such an entity in the JPA Diagram Editor. JPA Editor Diagram support only the four unidirectional kinds of relations between mapped superclass and an entity: One-to-One, One-to-Many, Many-to-One, Many-to-Many. Select some kind of relationship from the Palette, for example: One-to-One unidirectional. A relation is created, and a new attribute is added under the Relation Attributes section of the mapped superclass. Note: It is not possible to create a unidirectional relationship from an entity to a mapped superclass, as it is not allowed to create bi-directional relationship from a mapped superclass to an entity and vice versa. The visualization of the embeddables will be part of the Eclipse Kepler. Here can be found a detailed description how the embeddables and mapped superclass shall look like. A connection is created, and a new attribute is added under the Other Attributes section of the entity. Note: Instead of entity, the embeddable could be embedded into another embeddable. In the Eclipse IDE create new JPA 2.0 project. Open its diagram editor and create two entities and one embeddable. For more information how to create new entity and embeddable follow the steps described in the previous sections Create new Entity and Create new Embeddable. A relation is created, and a new attribute is added under the Relation Attributes section of the embeddable. Note: To be able to create any type kind of relationship, the embeddable must be pinned to an entity. Note: In case of bidirectional relationship, the embeddable must be pinned to exactly one entity. Note: In case an entity has a reference to a collection of instances of an embeddable, the only two possible kind of relationships are One-to-one and Many-to-one. Note: Because it is hard to remember, which relationships are allowed and which not, in Eclipse Kepler, the elements in the JPA Diagram Editor, that couldn't be involved in the concrete relation, will be marked as disabled and will be colored gray. For more detailed information about the usage of the JPA Editor watch the JPA Diagram Editor Demo.